Great launch day! Though the wind conditions were low variable and even a bit unpredictable, they were quite manageable. As a result we did have some rockets manage to find the “rocket eating trees”. All but two were recovered. Field was dry! Welcome to all of our new flyers with all of your creativity including the Sweetwater team! I appreciate all your help in setting up this morning. We loved seeing your new models and had fun watching your birds soar high on those E9 motors! I hope that we see you again soon. We had a number of new rockets fly for the first time today- Renegades, gliders, rebuilds, and higher power flights with the low winds. Some of the notable flights included Chris’ Mean Machine on an D12, Vagabond, V-2, Bits and Pieces, Maxi Alpha, executioner–all on E9’s, and Tom T’s “Harold the purple crayon” pierced the blue with a G-67. Lonnie’s upscale Bandit on a C cluster of 3 took off nicely. 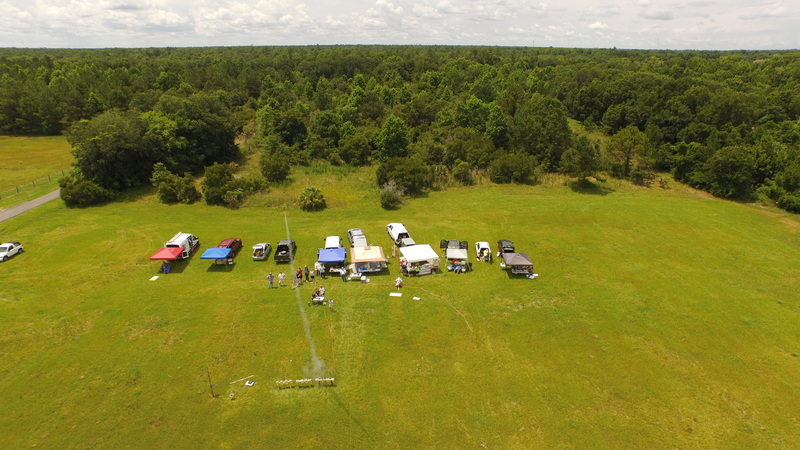 Chris M’s Gyroc and Draconian Maurader flew well, despite Tom’s mistake on pad control that sent the Gyroc flying instead of the announced rocket. All came out well, just a bit differently than anticipated. Remember that we will NOT be flying on July 4. See you on August 1, weather and field conditions permitting! Went back next day and found my lost rocket making total of lost rockets just one.